It seems like there should only be a finite number of ways to prepare grilled chicken. Yet I feel like every time we have grilled chicken, it's different than the last time. There are so many cuisines and flavors to draw from, it's easy to keep things interesting. While I already have a recipe for grilled rosemary chicken posted, and yes, this is also grilled rosemary chicken, believe me when I say that they are totally different recipes. Aside from the obvious fact that these are kabobs, they just have different flavor profiles. This recipe has a bit of a kick due to the crushed red pepper flakes, but it is easily tamed by the sweet and sour apricot dipping sauce. If you don't feel like going through the trouble of chopping and threading the chicken onto the skewers, then just grill the thighs by themselves. I went ahead and made this a 100% grilled dinner by grilling some potatoes and asparagus, and we all thoroughly enjoyed it. It's low-maintenace, healthy, easy, and fast. Exactly what you want in a summer meal. Combine 2 teaspoons of the rosemary, the brown sugar, salt, pepper and red pepper flakes in a small bowl. Place the chicken in a medium bowl, and drizzle the oil over it, tossing to coat. Sprinkle the spice mixture over the chicken and toss to coat well. Preheat your grill to medium-high heat (400-450 F), and oil the grates lightly . 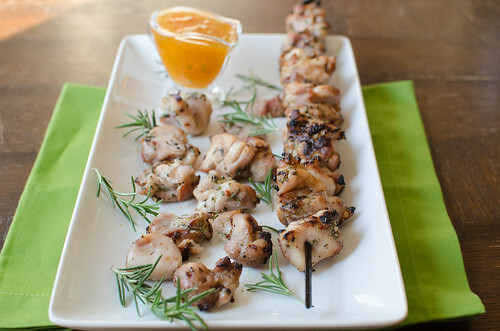 While the grill is heating, thread the chicken cubes onto skewers. Meanwhile, make the dipping sauce: Combine the remaining teaspoon of rosemary, the apricot preserves, a pinch of salt, and the rice vinegar in a small saucepan. Set over low heat and stir just until the mixture is heated through. Remove from heat and cover to keep warm. Arrange the kebabs on the grill and cook, turning every 3 minutes or so, until they are slightly charred on all sides and cooked through, about 12-15 minutes total. Transfer the kebabs to a platter to rest for about 5 minutes. Serve with the warm dipping sauce. Yum, you have me craving these again Josie! Glad your family enjoyed them. Next time I'm taking your advice and making some potatoes and asparagus on the side! Grilled asparagus... now that is a great idea for dinner tonight! 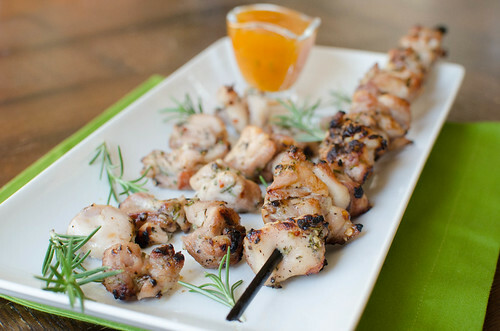 These kabobs looks amazing. I always tend to think of grilled chicken as boring but that's probably because my mom only made it one way. That apricot sauce sounds delicious! Not boring at all. I've been doing more 100% grilled meals too, for the ease of cleanup! These will have to be next up, they look delish!